The team at CCTV Monitoring are pleased to announce the launch of their new branding and website. Managing director, Stuart Capstick wanted to create a modernised and contemporary brand look and feel to compliment the continuous expansion and success of CCTV Monitoring. The new website shows the new, modern look and feel of the CCTV Monitoring brand, and has been designed with our customers and clients in mind. We have made our services easier to locate, and made contacting our team even easier. 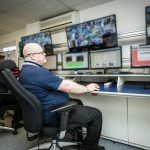 The website launch and brand refresh happens in line with CCTV Monitoring being named as 1 of 5 UK based stations to achieve the SureView Certified Station status, receiving the Gold award in recognition of our commitment to delivering the highest quality Immix Central Station monitoring and security services. We are very pleased with the new website and the new branding, and we are looking forward to rolling this out across the business in the coming months.